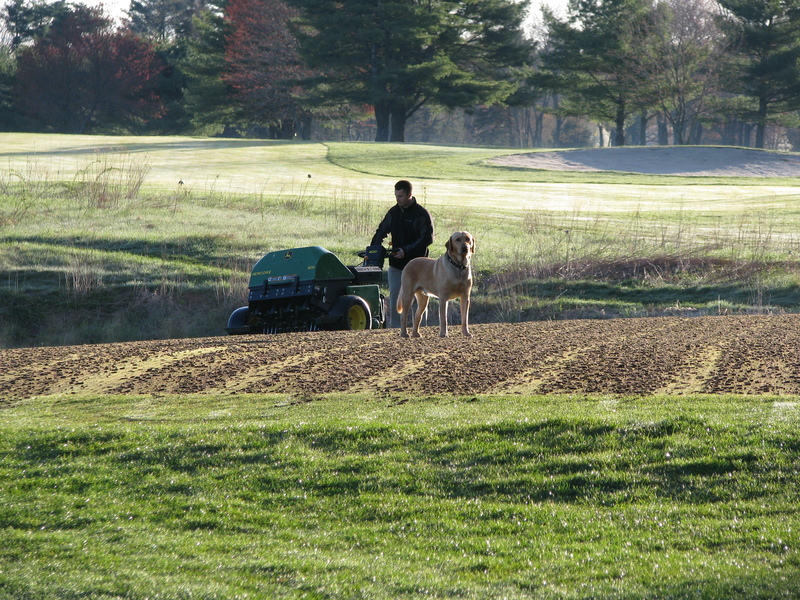 It seems like it was October just last week, and we were just finishing fall aeration. 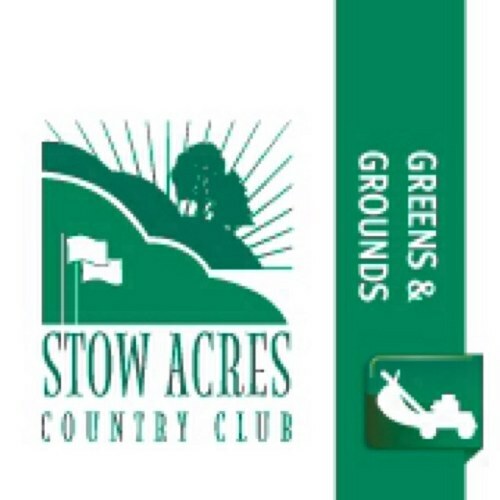 However, we have completed spring aeration here at Stow Acres already and your putting surface will go untouched until sometime this fall. The process, although very labor intensive and time-consuming, went very smooth. We were only interrupted once by a frost delay and that came on the North course last week. These cool temperatures at night have certainly made the healing process slow, but now approximately two weeks after completion, the South course is only days away from being fully recovered. We have rolled the South three times since we have punched holes, and the surface is almost back to its original surface. The North greens, even though they were just done about 8 days ago, are looking very healthy and the sandy surface is starting to settle. The process is long and tough so I have decided to include some pictures to explain the story. 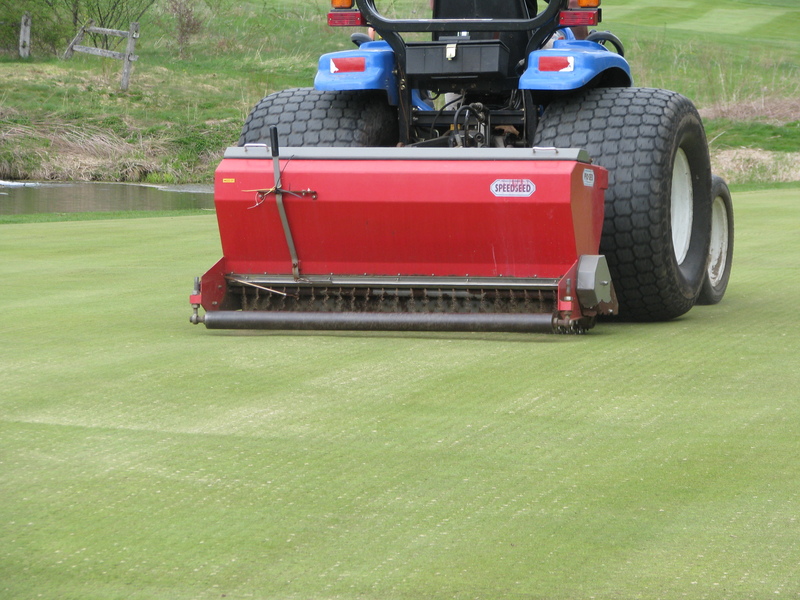 This machine pulls cores from the green. The cores are spaced at 2″ apart and are 3/8″ in diameter. They range from 3″ – 5″ deep. This is done to allow oxygen, water, and nutrients to reach the roots a little easier. 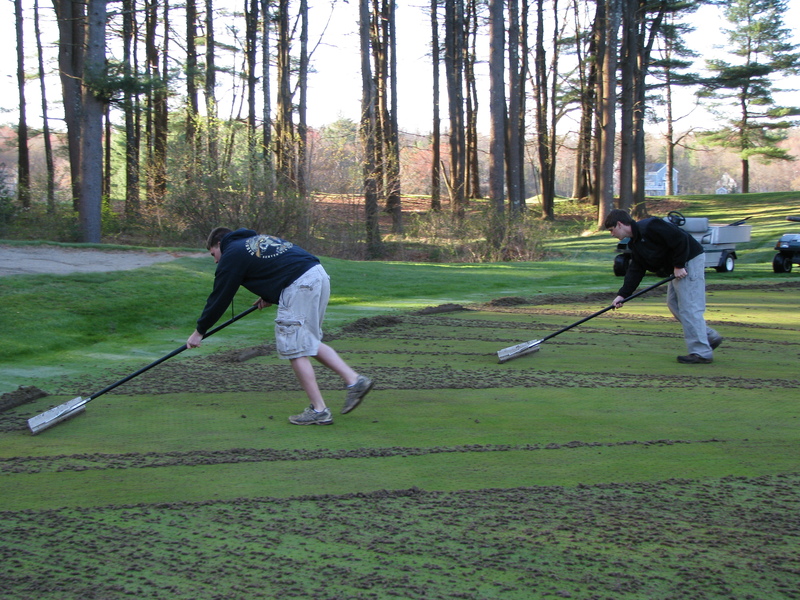 It breaks up and removes thatch from the subsurface as well as loosens up compact soils. 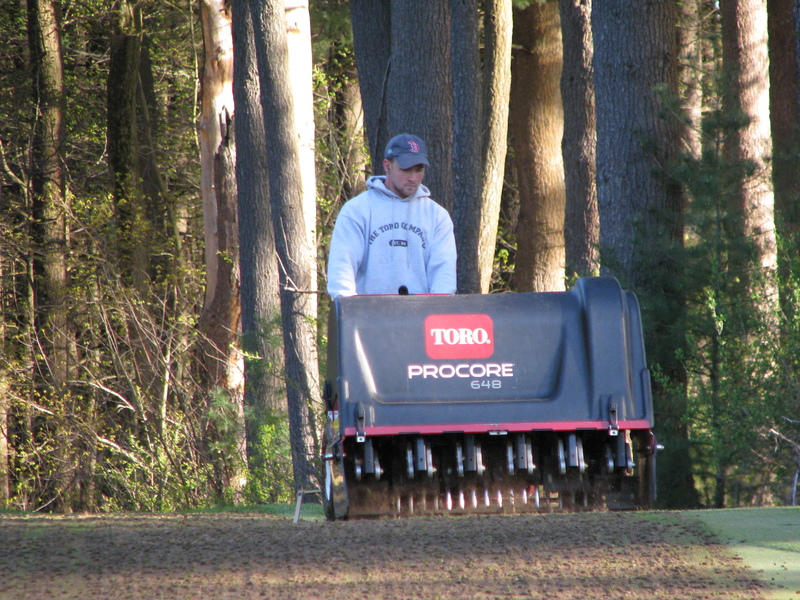 It is the first step in the aerification process. The cores are then pushed off and collected. This part of the process can be the most labor intensive and requires the most amount of people. 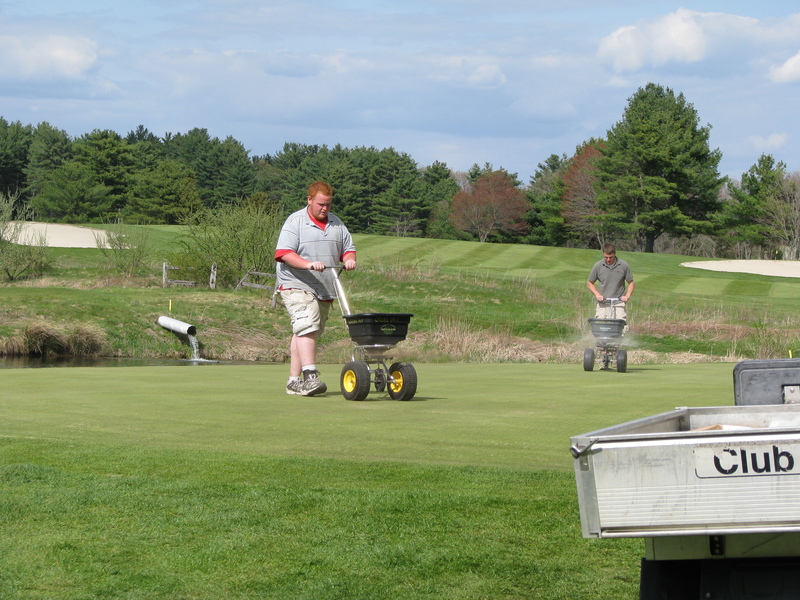 Chris and Dave are pictured here hustling to get the cores off of the 4th green. 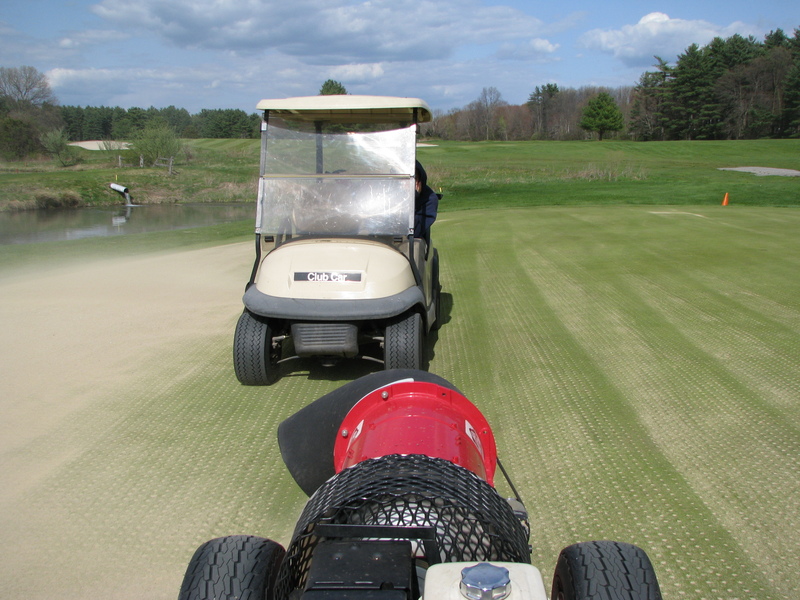 Next, the cores are picked up and the green is blown off to allow for the topdressing sand to be applied. Pictured below are the cores being collected so the green is finally ready to be topdressed. We use sand to fill the holes. It is 1.5mm particle size. We do this for a few reasons. First, the porosity is larger than soil so it allows for better drainage and nutrient delivery. It also doesn’t allow for the soil particles to bind as easily so the green remains soft enough to receive approach shots. Last, the sand allows for any imperfections to be filled making for a more consistent putting surface. 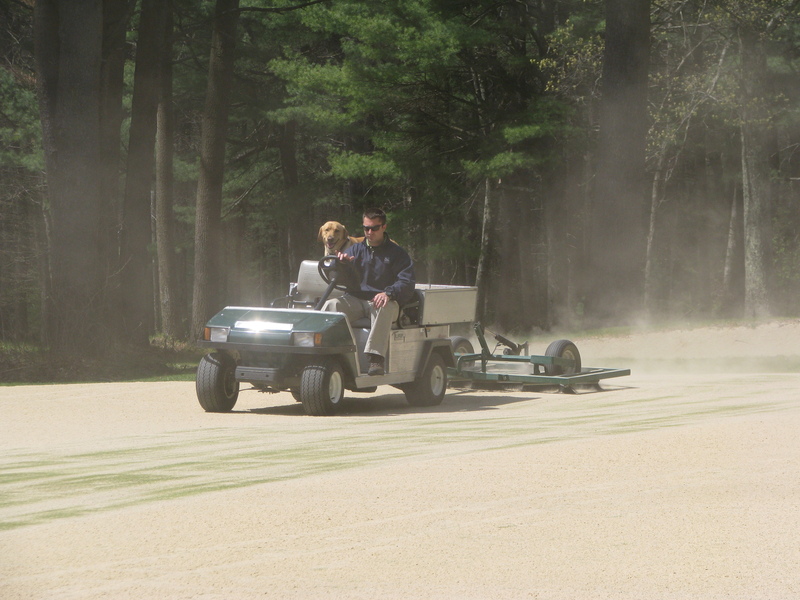 Pictured below is a green covered in topdressing sand before it is dragged and blown in. 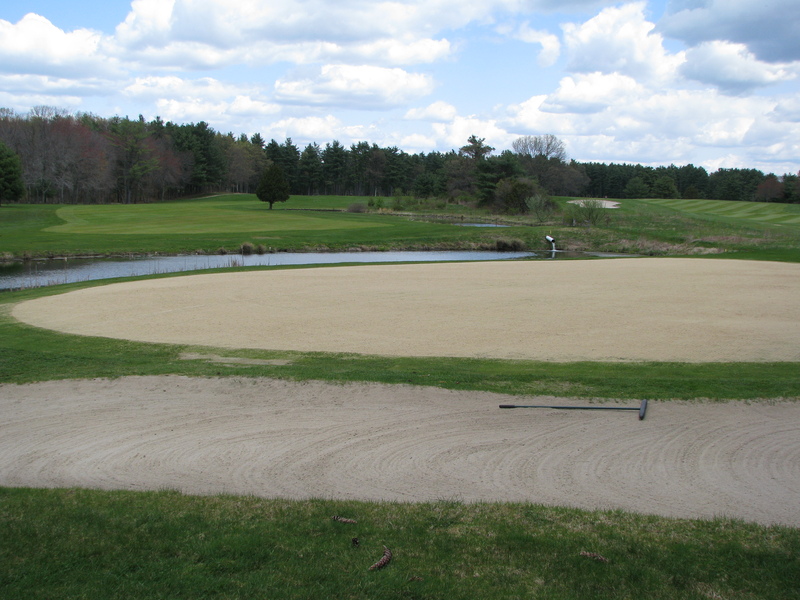 Once the green is topdressed, we allow for the sand to dry for approximately 30 minutes. 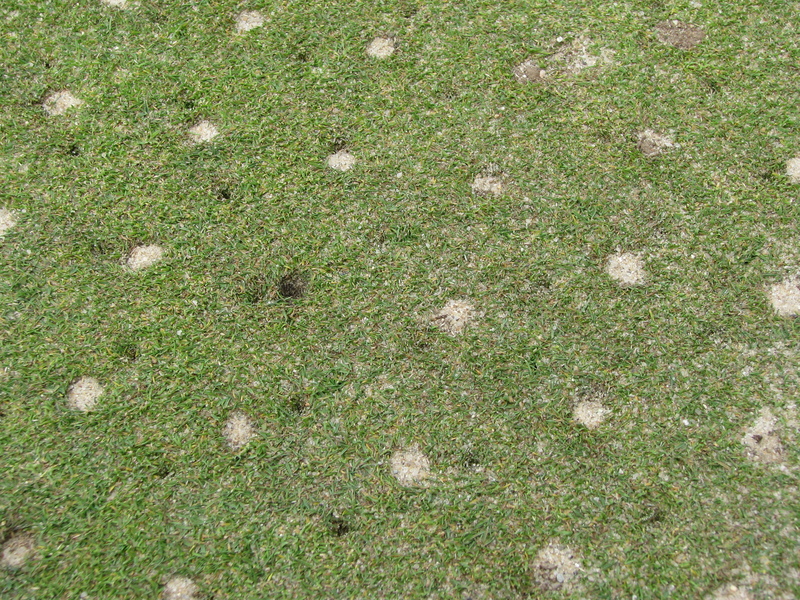 This is crucial because dragging wet sand into the holes will cause bruising and stress to the bentgrass plant. An organic product called Renovate is applied and then the sand and Renovate are dragged and blown into the holes pictured below. 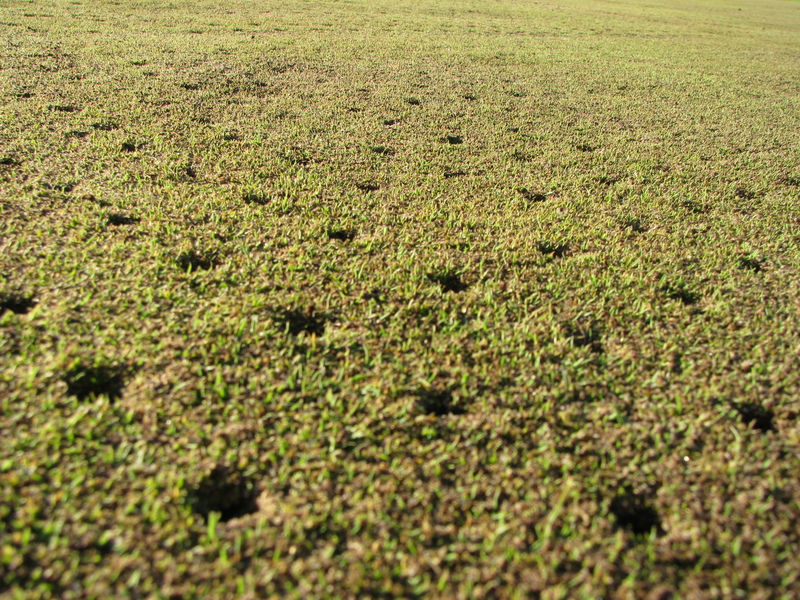 The holes fill in pretty quickly and we are left with a clean surface that is ready to seed and fertilize. We seed with a G1 bentgrass variety. This is an aggressive moving bentgrass that will help heal the holes in approximately 2 weeks. 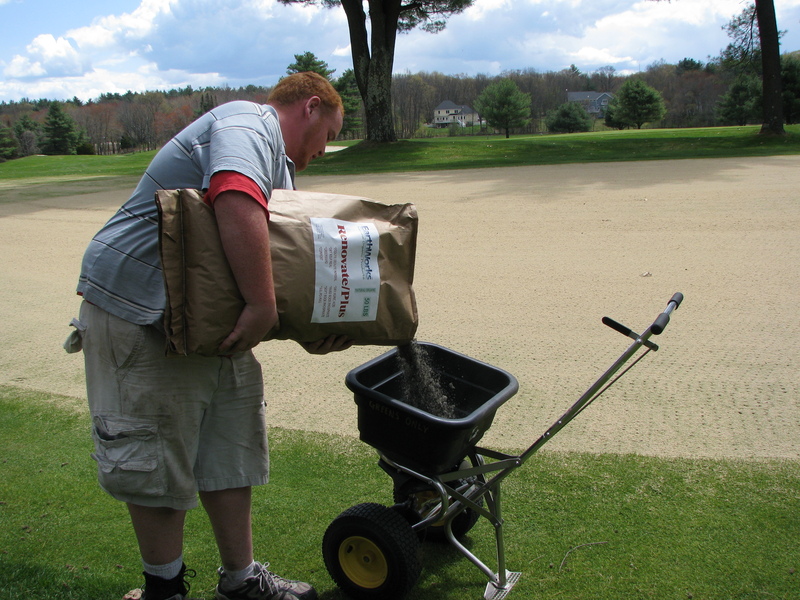 The fertilizer is a 5-4-5 organic blend that helps feed the existing turf and the new seed being applied. Once the green has been seeded it is ready for some water. 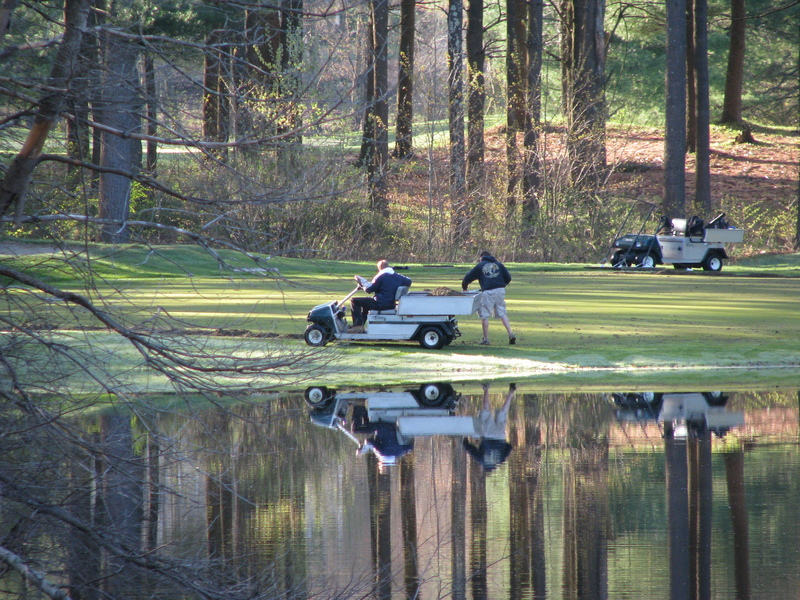 Water is one of the main components after aeration because the green has endured so much stress. Each green is watered for approximately 20 minutes immediately after and then they are watered again that night. The water helps hydrate the plant and push some the sand through into the holes. Thank you for your patience during this time of cultural practice to our greens. It is extremely beneficial to the putting surface. It will ensure a much healthier green throughout the season. 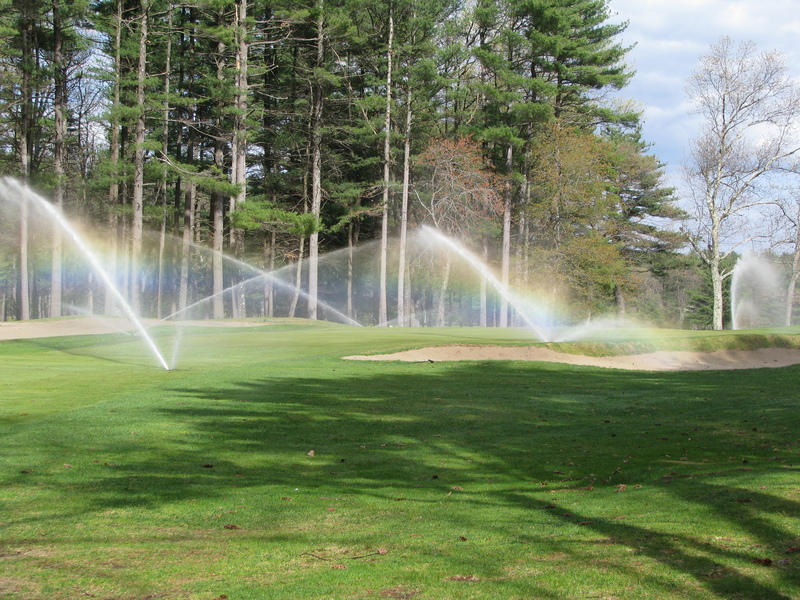 It will also allow us to use less water and product over the entire season. For any other questions regarding aeration, please feel free to contact me. If nature cooperates and temperatures remain warm at night, the greens should be back to normal by the end of next week. See you on the course! That’s a beasty aerator machine. I want one. Quick question though. Wouldn’t it be beneficial to let the cores deteriorate organically or would that take far to long?